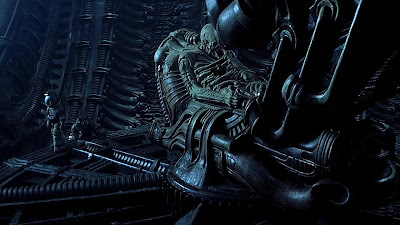 I remember the first time I saw Alien as a kid, and seeing the giant horseshoe shaped spaceship marooned on LV-426, with the remains of what looked like a giant elephant man seated at what looked like a giant gun. The creature was eventually nicknamed “the Space Jockey”, and fans everywhere, including me, wanted to know more about them. Where did they come from, what was their role in the universe, and most importantly, what was up with their long noses running into their sternums? 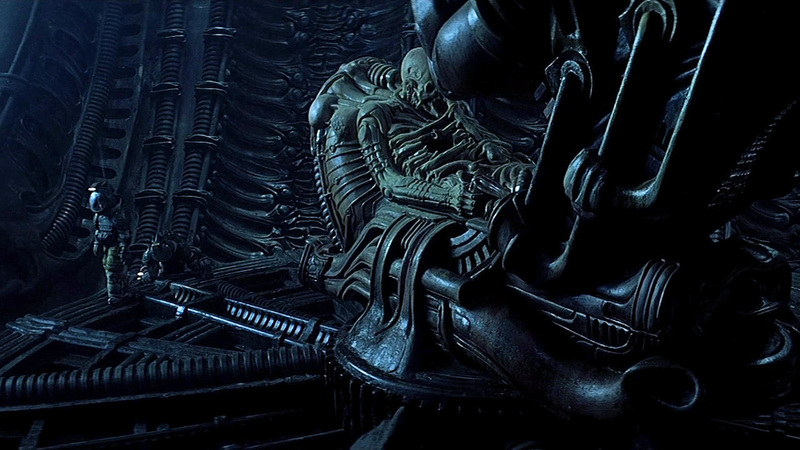 Well, Ridley Scott finally gave us two out of three of those answers with this past summer’s movie, Prometheus. And if the ending is any indication, we’ll find out the answer to the other question if/when we get a sequel. 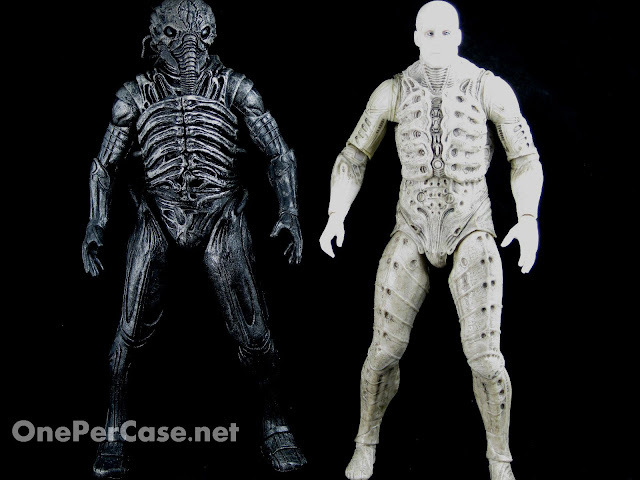 NECA, being the purveyors of action figures based off of all things that I personally love, saw fit to give us a line of figures based on this movie, to pose on a shelf adjacent to or near our Xenomorphs. One of the two figures in this first wave was none other than the Space Jockey… or more accurately now, the Chair Suit Engineer. And it turns out that the Space Jockey as we known him is really just a biomechanical space suit worn by the gargantuan humanoid Engineers. The packaging for this line is pretty simple, comprised of a heat sealed clamshell with interior art depicting the blackness of space and a field of stars, with a film synopsis and character shots on the back. No character bio or cross-sell. The figure itself is a beautifully sculpted rendering of the ill-fated space suit wearing Engineer. Seriously, look at the detail in that sculpt. Go ahead. Stare at it for a while. I’ll wait. Done? Yeah, I know, it’s awesome isn't it? NECA consistently impresses me with their sculpting talent, but this might be a new high for them. The deco is very simple, which is exactly as it should be, being mostly flat black with dry-brushed metallic tones and glossy black eye lenses. The articulation is about on par with what you’d expect from a figure in this scale, with ball hinges at the shoulders, elbows, hips and knees, and ball joints at the neck, wrists and ankles. And the figure doesn’t include any accessories, but honestly, he doesn’t need them. He’s an amazing piece on his own. There really isn't much else that can be said about this figure. It's beautiful in its simplicity. So in summary, even if you’re not a Prometheus fan, buy this Engineer. Prometheus Series 1 has been available for about a month now at Toys R Us, BBTS, and other fine action figure dealers. Same here, I loved the movie. Can't wait to see what comes next.